A friend recently gifted me a copy of “Wheels On Ice: Bicycling in Alaska 1898-1908.” In this short book, Alaska writer Terrence Cole compiled first-person accounts, journal entries, and photographs from a decade that saw a unique collision of two historic events: The Klondike Gold Rush, and the Victorian bicycle boom. At a time when millions of Americans were taking to the “wheel” for the first time, gold prospectors adopted the newly-adapted “safety bicycle” as a cheap and reliable form of transportation to the gold fields. Turn-of-the-century models were relatively easy to maintain, with robust frames, a single fixed gear, and few complicated parts. The main appeal was price — bicycles could be purchased for a fraction of the cost of a dog team. Traffic along the sled dog trails was frequent enough to maintain a good — if rough and narrow — trail for bicycles. Despite all the enthusiasm, bicycles never gained full traction during the Gold Rush. 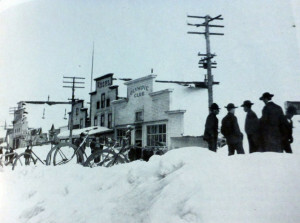 Wheelmen often suffered from severe cases of frostbite, snowblindness, and broken bones from falls on the ice. 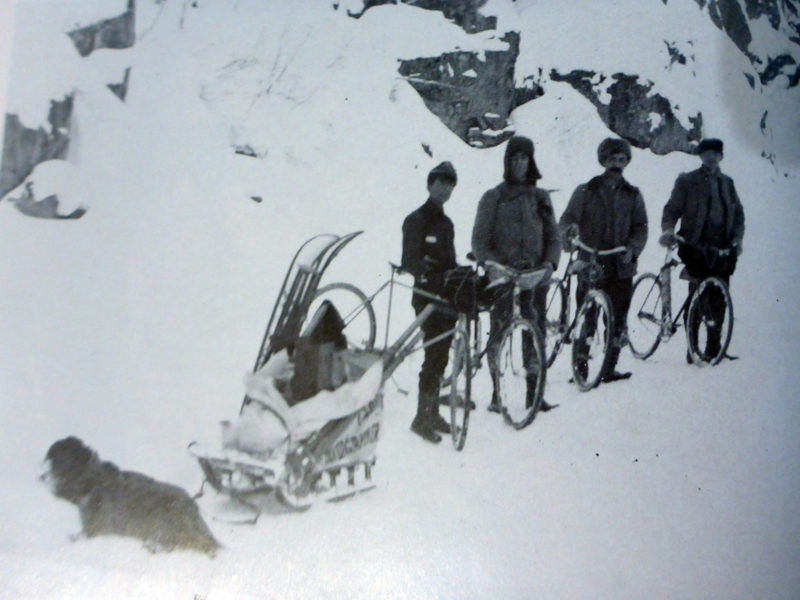 Bicycles often broke down in the worst weather — low temperatures led to frozen bearings and stiff tires. Cole notes that even amid the fever pitch of Alaska’s gold boom, cyclists on the trail were generally regarded as unwise and even deranged. The tales these men tell are an interesting window into a time when, in many ways, overland travel in Alaska wasn’t all that different than it is 115 years later. The route followed by thousands of prospectors from Whitehorse to the historic Klondike gold fields is still more or less the same, and the modern Yukon Quest Trail remains a rugged and treacherous route with few modern conveniences along its path. If anything, the late 19th-century version of the trail was considerably more comfortable, with frequent traffic to maintain the trail after snowstorms and wind events, and roadhouses offering meals and beds every 20 miles. A photo on the cover of “Wheels on Ice” depicts a cyclist beside his narrow-tire, fixed-gear bicycle. He’s wearing beaver mitts, a wool jacket and trousers, and felt boots, and there’s no extra equipment strapped to his frame. 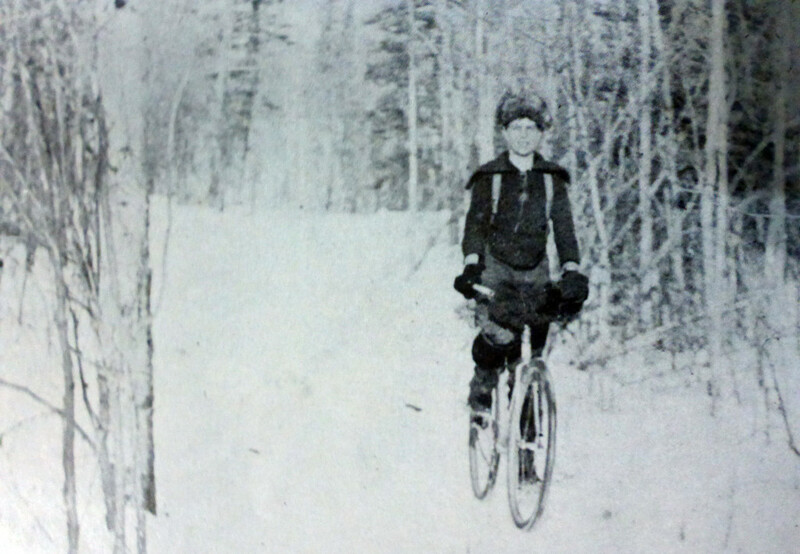 The caption notes that he set the “overland bicycle record” from Whitehorse to Dawson City in the winter of 1903, pedaling 400 miles in five days. For all we know, this remains the fastest recorded time by bicycle on this trail. Modern cyclists still travel this route as part of the Yukon Arctic Ultra winter race. Even with all of the technologies available to modern travelers — fat bikes, lightweight components, gears, high-tech cold-weather clothing, and race support — the modern bicycle record for the 430-mile route is still over seven days. Several Gold Rush-era wheelmen set out from Dawson toward the gold fields of Nome, all the way across Alaska on a route that largely followed the Yukon River. The journey was roughly a thousand miles, and the second half of the route is still traced by the Iditarod Trail. The historic cyclists’ accounts paint a picture of a route that hasn’t changed that much in a hundred years. The 1900 version traveled through the same villages and presented many of the same challenges as the modern trail. At this cutoff — probably similar to the current location of a safety cabin on Iditarod Trail— Jessons waited at a crowded roadhouse for three days until the wind had calmed sufficiently to allow him to cross the Norton Sound. These days, snowmobile travelers and Iditarod dog sled mushers still occasionally wait out storms, although modern weather forecasts and GPS technologies help remove some of the risk of heading out into a blow. Alaska travel hasn’t become much easier for modern cyclists, either. Jesson describes navigating open water on the rivers, riding at high speeds over blue ice, and headwinds so strong that he couldn’t pedal against the gusts. Cold temperatures led to exhaustion, and village accommodations were Spartan but inviting. Sometimes these cyclists’ accounts read so much like a modern Iditarod Trail race report that it’s almost jarring to come across a passage that is clearly from another era. Because it’s still 1900, they encounter Natives who have never seen or heard of a bicycle, and recount their reactions (“White man he set down, walk like hell”). A man disappears under the ice, never to be found, and it’s just one of those things that happen. “Wheels on Ice” is a wonderful archive from a unique era. Amid the current boom of fat bike production and the increasing popularity of winter cycling, this book is an interesting glimpse into the mindset of those who had this idea a hundred years ago. The conclusion: modern snow bikers still seek many of the same things that Gold Rushers sought: adventure, self-sufficiency, independence, and excitement. One of the only things missing in 2015 is gold. The book, published in 1985 by Alaska Northwest Publishing Company, is currently out of print. Used copies (at premium prices) are still available on Amazon. Terrence Cole is an acquaintance of ours. 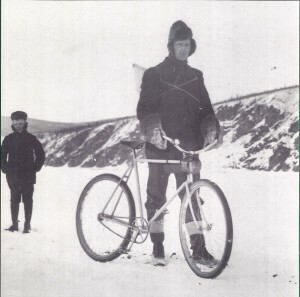 It would be interesting to republish the book with the fat bike craze going on and would be cool to have somebody compare how things were back then to how they are now. 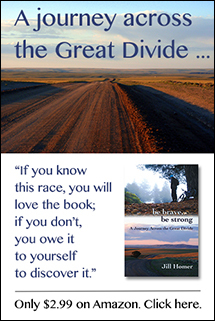 Maybe another book project for you, Jill? “never gained full traction” is a pun, right? Thanks for the interesting review!